A chainsaw can be one of the most powerful tools a person can own. A portable, mechanical saw with a set of metal teeth that are firmly attached to a rotating chain that is ran along guided bar. Here we take a look at the best chainsaws and chainsaw reviews to help guide you to a well-educated purchase! With a chainsaw you can slice through wood like it was butter, with little to no effort needed on your end. They are a great supplement option to choose instead of your manually operate handsaws, that can become exhausted, slow, and inaccurately cut—they just are not efficient—time wasters. Getting yourself the best chainsaw to literally cut your time in half, allowing you to quickly and easily cut through any amount of wood or thickness! With many options made available to you, it is important that you educate yourself as a consumer in order to find the the right chainsaw that is gong to fit your needs. The following guide will walk you through some of the best chainsaws available to you, with chainsaw reviews to help you through finding the perfect chainsaw to add to your tools. 4.0.2 2. Do battery powered chainsaws come with an extra battery and charger? 4.0.3 3. Does my chainsaw come fully—assembled? 4.0.4 4. How Do I Learn To Operate a Chainsaw? 4.0.5 5. What Personal Protective Gear do I need when operating a chainsaw? 4.0.6 6. Do I need to mix oil with gas for my gas chainsaw? 4.0.7 7. When do I know my chain is dull? What should I do? 4.0.8 8. Can I use regular motor oil for my chain bar lubricant? 4.0.9 9. What size of a chain bar should I get? 4.0.10 10. What kind of fuel do I use to fill up my chainsaw? 4.0.11 11. What is “kickback”? 4.0.12 12. How often does my chainsaw need a “tune-up”? Before you start looking for the best chainsaw that is going to fit your needs, we thought it would be helpful if you were aware of the different types of chainsaws that are available to you and how they operate. Corded: A corded chainsaw operates on electricity with a cord that feeds off it to plug into a nearby outlet to operate it. Battery: A battery ran chainsaw operates from a battery connected to the rotatory mechanism to power the saw that gives you more mobility. Gas: The most common chainsaw used runs on a small horsepower engine fueled by gas and high powered RPMs. Alligator Lopper: A new and innovative type of chainsaw that operates with a scissor-like cut to fully clamp around the wood and then cuts it in one fluent motion protecting you from kick-back or chain exposure. Not only should you understand the four different types of chainsaws that are made available to you. But you should understand how each type works, and where the advantages and disadvantages lie with each. Any of these chainsaws can be a versatile tool for you to use at your disposal, but everyone expects and needs different things for the type of use they are going to be doing. Let’s take a look at each type to help you understand and know which type is going to be right for you. Portable battery powered allows you to move around freely without the worry of a tangled cord or not being able to reach your cuts. No need to worry about lubricating in the correct areas—just filled the oil reservoir for auto-lubrication. Saves money in paying to refuel the engine with the battery power you all will need to recharge the battery periodically. Light weight design allows you to handle and operate for longer periods of time without getting fatigued. Re-charging the battery after each use can be an inconvenience for some. Not as powerful as a directly powered chainsaw with a cord or higher level operating fuel engines. Battery life can be infrequent at times and some users have had to opt to purchase a separate battery than the ones that come with your chainsaw initially. Doesn’t require re-fueling or re-charging after each time you use it. Can still cut at a high capacity with motors that ran on about 3.5 HP and 14.5 AMPS for efficient cutting. Self lubrication system to continually feed your engine oil for optimal efficiency. Easy to use tensioning systems that are designed to be simple and quick for every level of skill. Being connected with a cord limits your mobility and distance that you can travel with your chainsaw. Cord can become a safety hazard if working negligently it can become tangled, wrapped around objects, and possibly cause tripping. Lower in overall power than other chainsaws and may not cut as fast as a gas powered chainsaw. Has the most power out of any type of chainsaw running on a fuel 2-cycle engine for high rpms. Can cut through almost any size task or job that you may need it for. Little effort needed for guiding the saw down the cut your making. Gives you complete mobility with no cords attached to you, so you can take it anywhere you need. These chainsaws are typically more expensive than any of your other types because of their high powering function. They exhaust out environmentally hazardous fumes during their operation. Must be handled and used with special caution—safety guards are in place but with this kind of power you always want to be extra cautious. Will have the expense of filling up chainsaw periodically, and filling up your gas storage can you designate for it. Cutting edge design that will give you an easy and safe cut with a clamp mechanism to lock around your cut location—before it slices through in one motion. Easy to handle and ergonomically designed for light-weight handling and controlling. Can come with both a portable battery or electrical corded type to give you the benefits of both. Clamping system eliminates the possibility of ever getting kick back on your cuts. Side-ways cutting allows you to cut without burying your chain into the ground, unlike traditional chainsaws which become clogged and dull from this. Corded type can only reach certain distances, while the battery powered chainsaw will require recharging after each use. 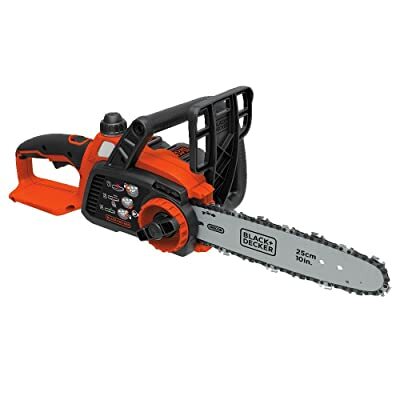 Can not cut anything over 4” in diameter, meaning this is a chainsaw that you will want for low duty work. One of the best chainsaws on the market today. Made by WORX, a leading brand in high powered working equipment and tools. This chain saw is ran on an electrical cord system with some incredible features you must take a look at. 3.5 HP and 14.5 AMP gives this corded chain saw the power that you would usually find with a gas powered engine saw. Built in chain mechanism that allows for your chain to maintain the proper tension for several uses—without worrying about your chain falling off. Replacement chains require no tools to install and tighten making this one of the easiest chain saws to take care. Automatic chain lubrication applies your lubricate throughout your use so you don’t have to worry about it—just fill the oil reservoir and your good to go. Shape and handle designed for the most optimal ergonomics while operating with a trigger button placed perfectly below your main handle for easy grabbing. 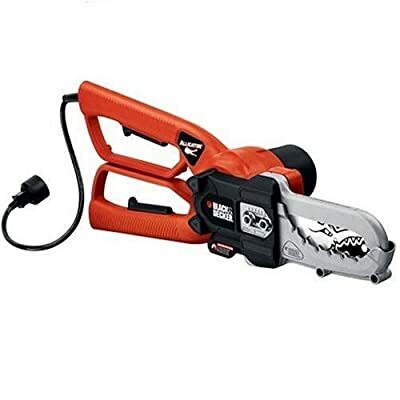 A household name like Black & Decker improves just about any product you find when it comes to tools and this battery powered machine is one of the most useful chainsaws on the market today. Operating on a 20V battery that you can order either with your purchase or without [you have a different battery in mind. 20V Max Lithium Ion battery powers this chainsaw to its full potential for a longer lasting duration and operation of up to 5X longer than most other batteries. Complete Mobility with no cords attached—give you the freedom to bring it just about anywhere. No Tools Required for tensioning, this chainsaw comes with a system that can be quickly and easily adjusted to maintain proper tension and performance. Most Ergonomically Safe chainsaws on the market to day, it comes built with a complete wrap around bale handle for optimal control and movement. Self-lubrication allows you to just fill the oil reservoir and the chainsaw will do the rest! No fuel is needed to be keep in stock at your home, this chainsaw’s battery is as simple as just recharging the battery every once in awhile. One of the highest rated in its class—order yours today to start cleaning up around your home! Gas powered chainsaws have been the cornerstone of the market ever since chainsaws were invented. A gas chainsaw is an extremely high performing tool, and for that reason they are the most expensive. 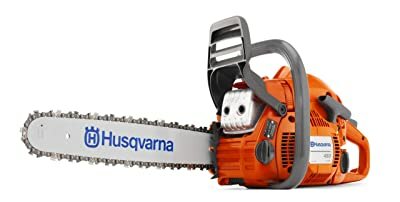 Check out this chainsaw by top name brand Husqvarna for one of our personal favorites at the best price and value you are going to find. Centrifugal Air Cleaning System technology rapidly intakes outside air turning it into clean and temperature controlled motion. 3.2 HP X-Torque engine reduces the release of toxic exhaust emissions and burns low fuel amounts. Smart Start feature that allows you to start the engine with little to no effort on your part as part of the choke/stop controls. Ergonomically designed and crafted with a lightweight frame and engine to reduce fatigue that usual gas powered chainsaws weigh you down with. To get one of he most technology advanced gas powered chainsaws on the market, get yours today at this chainsaw! An entirely new model of chainsaws that are changing the way you saw. Black and Decker has constructed something special here, and we believe it is one of the safest and most off all—efficient chainsaw you can get your hands on right now. Powered by an electrical cord the LP1000 is a tool to marvel and amaze. 4.5 Amp Motor to give you plenty of power to slice through tree limbs and branches quickly. Clamping Jaws that are what makes this saw far and beyond any other make or model to clamp around your branch or limb before slicing through—in one motion. Scissor like action that allows easy and un-intimidating operation for any chainsaw user who needs to cut up some fallen branches. Light weight design and easy to clamp and close mechanics let you work less—and cut more. Side-to-Side cutting finally eliminates the nuisance of cutting down and through your ground to avoid dulling or clogging up your chain. Auto-chain tensioning gives the user a maintained cutting performance by simply loosening the bar retainer bolts to allow the bar to automatically regain perfect tension. Make cutting and pruning up your trees and bushes a simple and quick task with this ultra safe chainsaw and jump on chainsaw today! We realize that using a chainsaw exposes you to may very extremely hazardous and potentially fatal accidents. To make sure that your chosen chainsaw is used correctly and most importantly—safely. We have included some rules and guidelines you always need to follow when you are operating a chainsaw. If you follow the following rules and you ensure that you fully understand on to operate your selected chainsaw, then you will be able to work accident and injury-free and enjoy your newly purchased tool. Most chainsaws will come with an included small amount of oil to fill your oil reservoir with, and some times they do come with a lubricant for your chain too. Check with the supplier to see or refer to the instruction manual for what type it takes. 2. Do battery powered chainsaws come with an extra battery and charger? A battery powered chainsaw will come with one battery and a recharger to plug into any of your outlets. Some models will give you an option of including the battery or you can choose not to, and purchase a different one that may cost more – but is more effective. 3. Does my chainsaw come fully—assembled? Yes, when you order your chainsaw it will come completely assembled. The only thing you may have to put on some of them is the handle, which they will provide you with instructions on and usually only takes just a couple of screwed to fasten. 4. How Do I Learn To Operate a Chainsaw? There are a lot of really good resources for you to find on how to properly learn how to use your chainsaw. The first one is to refer to your instruction manual that will come with your chainsaw. It will show you step by step, with safety precautions to take. 5. What Personal Protective Gear do I need when operating a chainsaw? You must always wear as much PPE as you can when operating a chainsaw. Proper eye protection, leather gloves, armor chaps for your legs, steel toe boots, and any other protective clothing you can get your hands on. The OSHA standards can be found here. 6. Do I need to mix oil with gas for my gas chainsaw? Gas powered chainsaws come with a 2-cycle engine which requires gas and oil to be mixed. This is separate from your oil reservoir that is used to lubricate your chain. Buy these mixtures pre-mixed and purchase oil to lubricate separately. Most chainsaws will come included with both of these. 7. When do I know my chain is dull? What should I do? 8. Can I use regular motor oil for my chain bar lubricant? It is highly recommended that you use a high quality chain bar oil for your lubricant. Bar and chain oil comes with a “high-tack” additive which will help prevent from fall off your chain as it rotates. In other words this oil sticks to your chain enough to stay on the chain, while distributing perfect lubrication—and better performance. 9. What size of a chain bar should I get? Chainsaws come in a variety of chain bar size lengths. You always want your chainsaw to be be longer the bigger the item is that you are cutting. For standard use that is not commercial you typically want a 16-18 in. chainsaw or lower. 10. What kind of fuel do I use to fill up my chainsaw? It is typically recommended by most of the big name brand manufacturers like STIHL, Husqvarna, and Black and Decker to use a gasoline mixture of no more than 10% ethanol. This happens when you are operating your chainsaw and the chain gets pinched in the wood or snags something solid. The force of the chain being stuck for a millisecond causes the chainsaw to bounce back or up towards you. The severity of this depends on the chains speed when it contacts these objects, the angle of contact, and the condition that your chain is in. To avoid this make sure your saw is sharp, you are cutting the proper angle, and applying a balanced pressure when sawing. 12. How often does my chainsaw need a “tune-up”? This will depend on how often you are using your chainsaw and for what purpose. Refer to your owner’s manual that comes included with your chainsaw as different manufacturing brands have different recommendations. We hope that you have found this information helpful, and it has provided the assistance that you need to find the chainsaw that is going to fit your overall needs. You may only need to use your chainsaw periodically or you might be using it for a long term project every weekend, regardless of how much you may use yours—you need to always make a educated and beneficial purchase when decided on any of the featured best chainsaws and chainsaw reviews. Please feel free to leave a comment below, tell us about your personal experiences, and ask any questions that you may have! Thank you for reading!